A rare Charles I East Anglian spoon by Arthur Haslewood of Norwich (1635) has been sold for £11,250 in a Somerset sale. 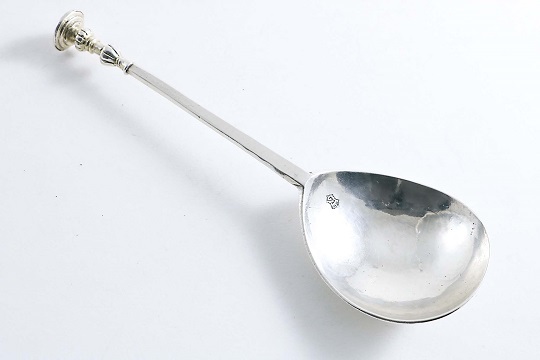 The spoon was one of the leading lots in the sale of over 800 items of silver and vertu sold earlier this month in the Lawrences Auctioneers’ Spring Fine Art auction. £3250 for an early portrait miniature by the celebrated master George Engleheart (1750-1829). £8500 paid for a pair of George III cast silvergilt candlesticks by Thomas Pitts (1806), which were of exceptional quality and in fine condition. A George II Irish provincial marrow scoop, made in Kinsale in c.1730, took the top honours in a small collection of similar scoops and was bought for £10,000. A snuff box of Arctic interest, awarded by Captain James Clark Ross to Captain Richard Wallace in 1833, made £6875. A tiny Victorian vinaigrette in the form of a flower upon a stalk, weighing just 1/3rd of an ounce, was just 4.5cm long and quadrupled hopes to make £2000. The sale ended on another high note as a further snuff box depicting a hunting scene from 1828 was chased to £3750 to bring the day’s total to just under £340,000.